. 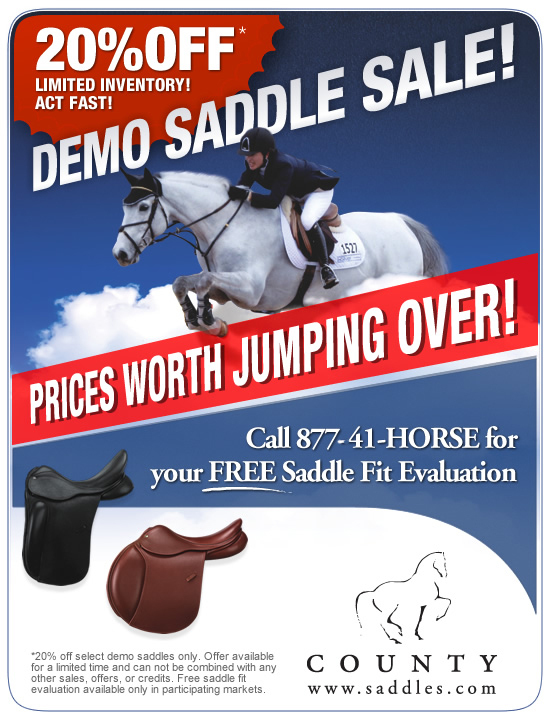 The Sensation and Innovation jumping saddles solve the chronic problem of high, narrow withers with only one saddle pad. Despite the economic uncertainty caused by mounting U.S. debt and the fiscal cliff budget crisis, County Saddlery is riding high with robust sales of innovative new saddles. Fiscal cliff budget talks between the White House and Congress aimed at averting another recession appear to be faltering, yet County reports continued brisk business, with its Sensation and Innovation jumping saddles besting the competition with a cutting-edge design that solves the high, narrow withers problem. To avert the fiscal cliff crisis rooted in deepening U.S. debt troubles, leaders in Congress hope to reach a legislative compromise soon hinging on achieving the right balance between targeted revenue increases and spending cuts. Proposals under discussion include increasing the top income tax rate, raising the capital gains and dividends tax rates, closing tax loopholes, reducing discretionary spending and reforming entitlements. The term “fiscal cliff” refers to the economic predicament that the U.S. government faces at the end of 2012, when the terms of the Budget Control Act of 2011 are scheduled to go into effect. Tax increases set for December 31, 2012, include elimination of the 2001-2003 tax cuts, payroll tax cuts and select business tax breaks, as well as expansion of the alternative minimum tax and imposition of taxes related to President Barack Obama’s health care law. The tax increases are to be accompanied by deep, automatic spending cuts, as agreed to in the 2011 debt ceiling deal, disproportionally targeting the defense budget and Medicare. Despite the fiscal cliff predicament, County Saddlery’s smart saddles continue to drive strong sales. The Sensation and Innovation jumping saddles solve the chronic problem of high, narrow withers with only one saddle pad. The innovative saddles are designed to provide unmatched comfort and clearance for horses with high, narrow withers, according to the company, providing unprecedented pain relief for the horse and maximum performance for the rider. Withers are typically the highest part of a horse's back, located at the base of the neck above the shoulders – the height of a horse is measured up to the withers. For jumping horses with high, narrow withers, saddles often are a painful, difficult fit, forcing riders to compensate by using extra saddle pads. But riders’ efforts to fix the high withers problem with saddle pads are misguided, according to available research. County’s traditional methods take longer and require a higher degree of craftsmanship than competitors’ methods, but once a rider sits in a County, the results are clearly worth it. The company’s commitment to quality and detail is reflected in every saddle it makes. Resisting the trend toward cheaper production methods that use foam-rubber panels and plastic trees, County saddles are handmade on laminated beech-wood trees, covered in the world’s finest leather, and flocked with pure wool to maximize horses' comfort and fit. One of the few saddlery companies in the world to make their own tree points, County sets the industry standard in design and innovation. Online Retailer Zazzle is the Site Selected for New County Saddlery's Online Store. Leading saddle-maker County Saddlery announced its release of a new line of promotional products for equestrian enthusiasts in time for the holiday shopping season, with online retailer Zazzle.com selected to house the new County online store. The County store on Zazzle.com, which features gifts including T-shirts, messenger bags, caps and mugs, and cool things for kids and toddlers is currently available at Zazzles. Featured County promotional items include clothing such as County logo T-shirts, sweatshirts, polo shirts and caps, as well as accessories including messenger bags and tote bags, and home and pet items including pillows, pitchers, mugs, stationery and dog shirts. County also offers baby and children’s clothing, note cards and stamps. In addition to its Zazzle promotional product offerings, County Saddlery continues to offer a full range of innovative horse products on its online store at https://shop.countysaddlery.com/, featuring saddle pads, girths and leathers, as well – the new County Show Scrim Sheet and County Coolmax Coolers. The complete line of County custom-made saddles is featured on the company’s website at http://www.saddles.com. 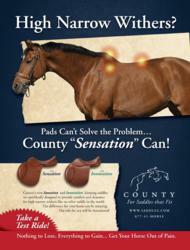 For more information, readers should visit County’s website at http://www.countysaddlery.com or call 1-877-41-HORSE.